Today is Pungenday, the 40th day of Discord, in the YOLD 3185. DLP® LightCrafter Display 2000 is an easy-to-use, plug-and-play evaluation platform for a wide array of ultra-mobile and ultra-portable display applications in consumer, wearables, industrial, medical, and Internet of Things (IoT) markets. The evaluation module (EVM) features the DLP2000 chipset comprised of the DLP2000 .2 nHD DMD, DLPC2607 display controller and DLPA1000 PMIC/LED driver. This EVM comes equipped with a production ready optical engine and processor interface supporting 8/16/24-bit RGB parallel video interface in a small-form factor. And of course this got picked up by the makers. 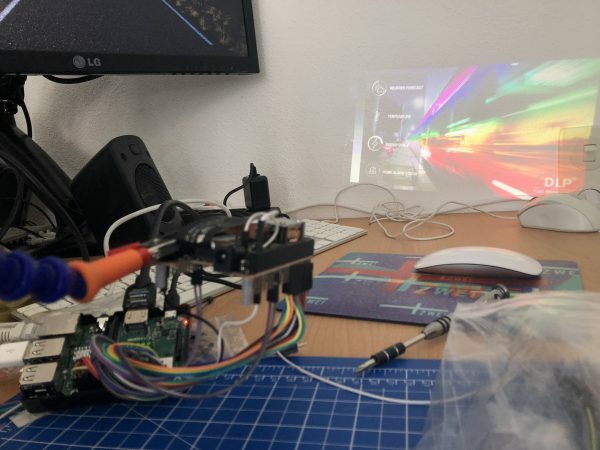 In the hands of people like MickMake who designed an adapter PCB for the RaspberryPi Zero W to the smallest projector available from TI. After I had learned about the existence of those small projectors I had to get a couple and try for myself. There would be so many immediate and potential applications in our house. 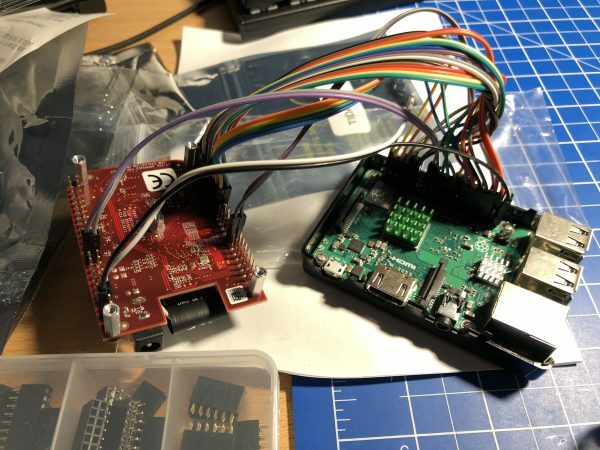 After having them delivered I did the first trial with just a breadboard and the Raspberry Pi 3. The projector module has a native resolution of 640×360 – so not exactly high-pixel-density. 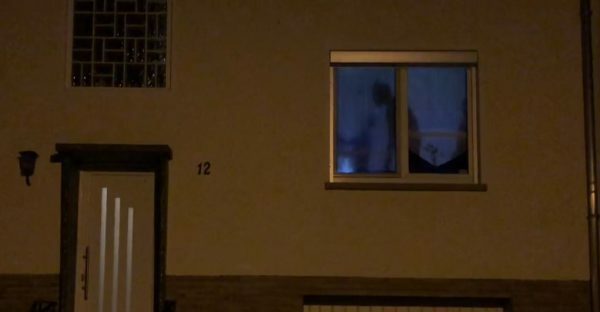 And of course if the image is projected bigger the screen-door effect is quite noticeable. Also it’s not the brightest of images depending on the size. For the usual use-cases the brightness is definitely sufficient. low resolution is an issue for text and web content – it is not so much of an issue for moving pictures as you might think. Video playback is well usable. flimsy optics that you need to set focus manually – works but there is no automatic focus or alike. 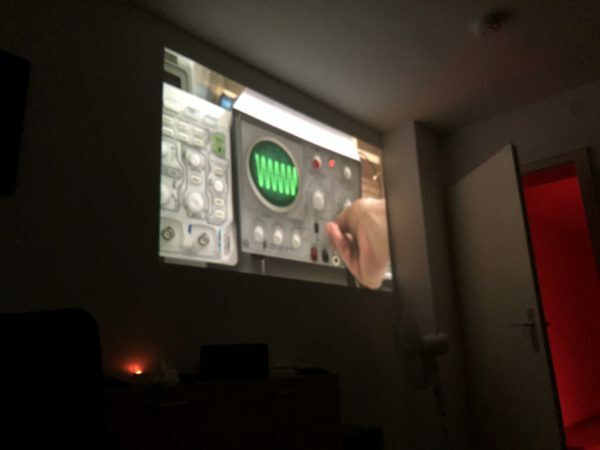 low brightness is not always bad – one of our specific use cases requires an as dim as possible image with fine grain control of thr brightness which this projector has. 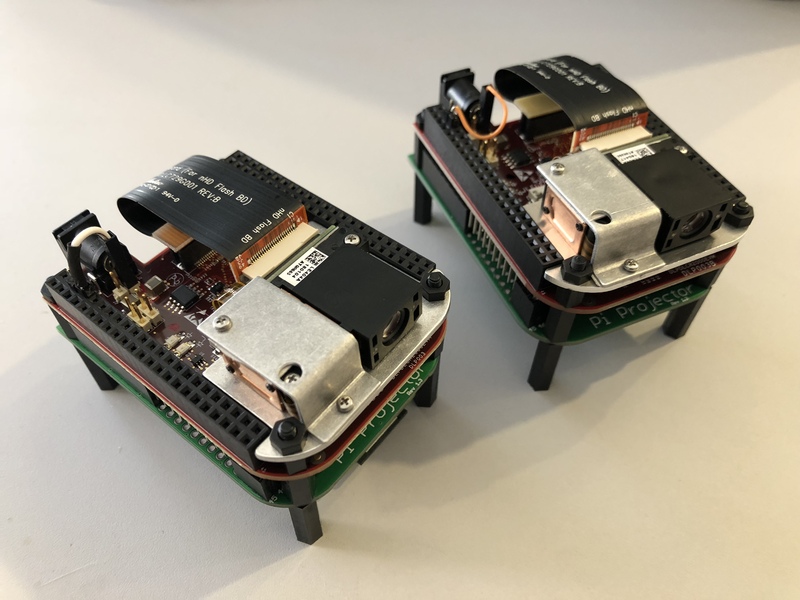 extremely small footprint / size allows to integrate this device into places you would not have thought of. almost fully silent operation – the only moving part that makes a sound is the color wheel inside the DLP module. You have to put your ear right onto it to hear anything. passive cooling sufficient – even at full brightness an added heat sink is enough to dissipate the heat generated by the LED. So what are these use cases that require such a projector you ask? For the last 20+ years I am used to sleep with a “night playlist” running. So far a LED TV was used at the lowest brightness possible. Still it was pretty bright. The projector module allows to dim the brightness down to almost “moon brightness” and also allows to adjust the color balance towards the reds. This means: the perfect night projection is possible! And the power consumption is extremely low. A well watchable lowest brightness red-shifted image also means much lower temperatures on the projector module – it’s crazy how low powered, low temperature. 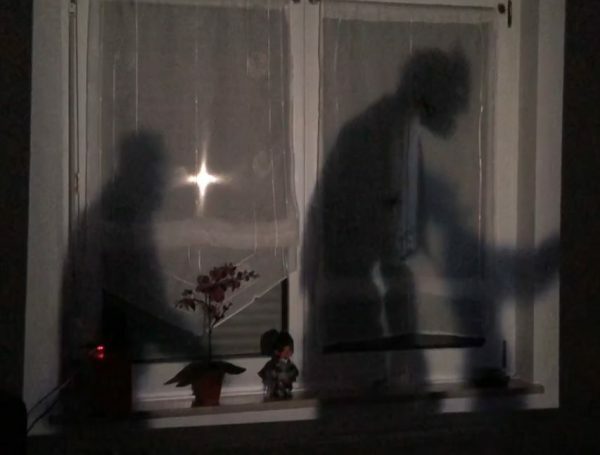 Because the projector is small, low-powered and bright enough for back-lit projection we tried and succeeded with a Halloween window projection scene the last season. When projecting information is that cheap and power efficient it really shines when used to display overall status information like house-alarm status, general switch maps, locations of family members and so on. I’ve left those to your imagination as these kind of status displays are more or less giving away a lot of personal information that isn’t well suited for the internet. Many cars these days come with head up displays. 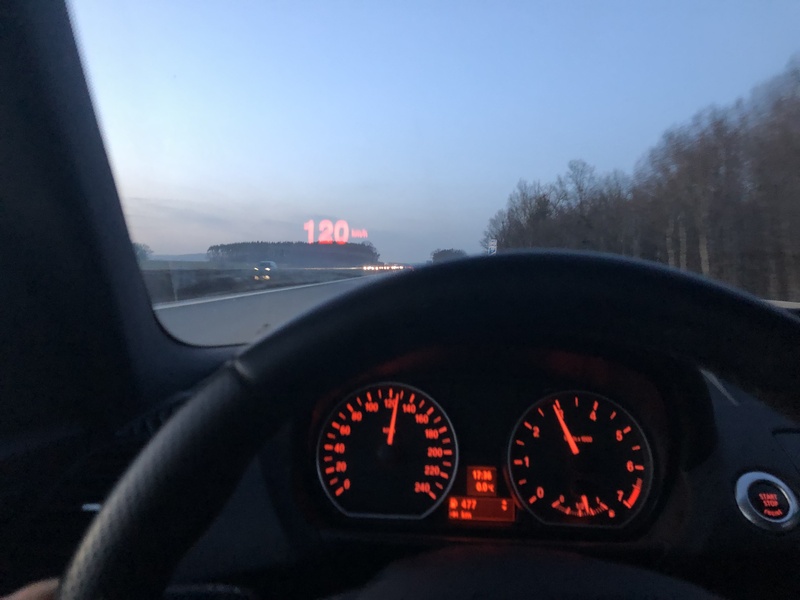 These kind of displays are used to make information like the current speed appear “floating” over the street ahead right in your field of vision. This has the clear advantage that the driver can stay focused on the street rather than looking away from the street and to the speedometer. As practical as it seems these displays are not easy to build and seemingly not easy to design. Every time I came across one it’s built-in functionalities where limited in a way that I only can assume not a lot of thought had gone into what exactly would the driver like to see and how that would be displayed. There was always so much left to desire. Apparently the technology behind these HUDs is at a point where it’s quite affordable to start playing with some ideas to retrofit a car with a more personal and likeable version. So I started to take a look at what is available – smart phones have bright displays and I had never tried to see what happens when you try to utilize them to project information into the windshield. So I tried. There are some retrofit adhesive film solutions available that claim to help with that. I have not tried any yet. To be honest: to my eye the difference is noticeable but not a deal-breaker. So I’ve tried apps available. They work. But they do a lot of things different from how I would have expected or done them. They are bearable, but I think it could be done better. tldr: I started prototyping away and made a list of things that need to be done about the existing HUD applications. display orientation according to driving direction – I had expected all HUD applications to do this. They know the driving direction. They know how the device is oriented in space. They can tell which direction the windshield is. They know how to correctly turn the screen. They do not do that. None of them. speed steps interpolation – GPS only delivers a speed update every second or so. In this time speed might jump up and down by more than +1. The display has 60 fps and gyros to play with and interpolate… I want smooth number transitions. speed-limit display – apparently this is a huge issue looking at the data availability. There seems to be open-street-map data and options to contribute. Maybe that can be added. have a non-hud mode – non mirrored to use for example to set speed limits and contribute to OpenStreetMap this way! automatically switch between HUD and non-HUD mode – because the device knows it’s orientation in space – if you pick it up from the dashboard and look into it, why not automatically switch? speed zones color coding – change the color of the speed display depending on configurable speed regions. 0-80 is green, 80-130 is yellow, 130-250 is red. turn display off when car stopped – if there’s nothing displayed or needs to be displayed, for example because the car stopped the display can be turned off completely on it’s own. 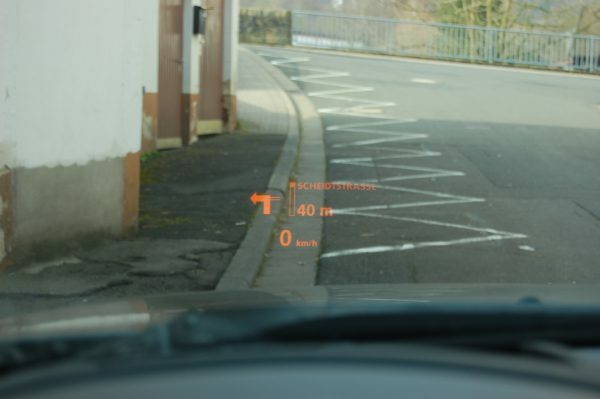 What would you want to have in such a HUD in your car?